"It is a common misconception amongst pigeon feeders that birds breed regardless of food supply and that they will starve to death if quantities are reduced. This is not the case. Pigeon numbers are dictated by the extent of available food and the only real way to control numbers is to reduce the amount they eat. On average, a pair of pigeons will breed 4-6 times a year, but breeding will increase dramatically if the food supply increases. Conversely, if availability is reduced gradually, pigeons will simply slow down breeding or stop altogether. Flock size is thereby lowered. 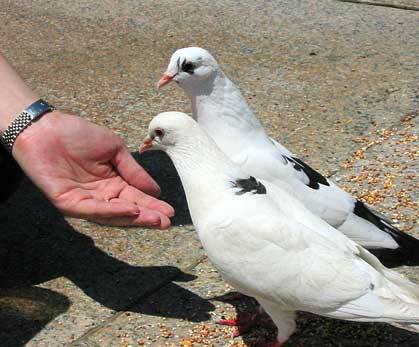 So one of the hardest tasks is to persuade well-meaning pigeon lovers not to feed. They must realize that unlimited feeding on a regular basis causes overpopulation, resulting inevitably in others deciding to cull." The meal this Blue Bar is enjoying will load it with way too much fat.
" 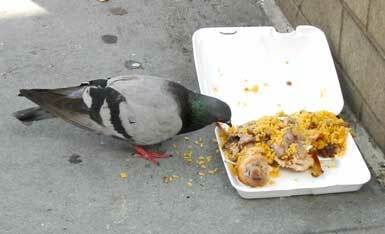 Approximately 90% of pigeons die in their first year and the main cause of death is starvation. 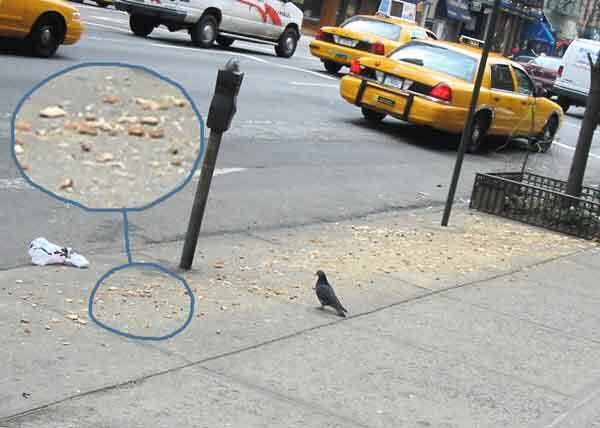 The mortality rate of adult pigeons is very low, typically around 11% (2). Therefore when culling is carried out on a pigeon population, the vacancies left by the dead birds are quickly filled by young birds." Also, within a flock, the percentage of birds in mated breeding pairs is quite low. Most of the pigeons in any flock will be without mates and not breeding. I just picked up a juvenile pigeon that is in very bad shape due solely to the no feeding policy. A baby pigeon stays with the parents for from 4 to 6 weeks learning how to fend for itself from them. This is not like a chicken hatchling that is fully feathered and ready to eat the moment it comes out of the egg. The pigeon is an altricial bird meaning its born naked and blind like a human baby. It has to depend on the parents for survival like a human baby. It has to be protected from harm like a human baby. It has to be taught to forage for itself like a human baby. Unfortunately, a sick bird can't go to the doctor like a human baby can. A sick bird needs us to do it for him. The juvenile pigeon should not leave the nest until it's ready to go like a human baby. If the parents don't have enough to feed the youngster, they either chase it from the nest or it feels forced to leave of its own volition. This bird belongs in his nest but he was on the street. He's less than 4 weeks old and completely unable to survive out there. I found him hugging an outdoor garbage basket. He is dehydrated and that doesn't mean he's thirsty. His cells don't have enough fluid to function properly. He is very, very thin and feels very sick. His parents did not have enough food to take good care of him. This bird does not have the strength to eat on his own even if he knows how to eat which I doubt. When a bird is badly dehydrated, he throws up food. I don't know why that happens but it's part of the dehydration syndrome. That means he has to be fully hydrated first. There is no use in feeding him if he is going to throw it up. Right now there is no way of knowing if he will make it but that shouldn't stop anyone from trying. Do you know what has to be done to save him? He has to be hydrated with Pedialyte every hour until there is enough liquid in him that liquid droppings start. Then, he has to be given a baby bird liquid formula. He has to be given vitamins and minerals. Then, his system has to be conditioned to accept solid food by feeding a semi-solid food like wet Purina Puppy Chow or a liquid diet like Kaytee Extract. Then, he has to be given the conditioning system regular seed mixed in with the Chow. Then, he has to go onto solid food only, something he should have gotten when he was two weeks old. He's so run down, he has to be given drugs to clean out his system before anything opportunistic comes along and kills him. All this for what, because people aren't allowed to feed? How long will it take him to come back, maybe a month? That means I can't bring in another bird that would take his place for a month. That means one bird out there will die within the month. There simply aren't enough people to take care of these downed birds. What are these birds supposed to eat? White bread has no value. These birds are seedeaters. How are they going to survive through a winter if people are not allowed to furnish food? In heavy winters heroic airdrops are made to cattle and other wild herds but here in the City, we aren't even allowed to get our pigeons through the winter. We know that whoever is in charge of these insane rules wants the pigeons to die but I wonder if they would feel the same way if confronted with a bird like the one I have to try to save. I wonder if their hearts would be so cold if they had just one suffering pigeon baby in their hands. These are our birds. It's our City and I feel fed up to here with the treatment that is being dished out instead of basic humane care. People cry for the endangered peregrine falcon so we are trying to reintroduce them to this area. What are they supposed to eat if there are no pigeons? What are the beloved Central Park red tailed hawks supposed to eat when the ground food (rodents) run out in the winter? The hypocrisy is that the same people who applaud the efforts to reintroduce endangered species here are fighting very hard to kill them by eliminating their food supply. These same people are breaking the food chain by their own rules and then go home to feel very badly about the extinction of species. These people are doing this and they are too stupid to realize it. The endangered species acts should apply to pigeons because without them, there will be less species to protect. If you guys need a poster child for what is going on out there, you don't have to go too far because I have one. You don't really need my bird for that. Look under cars, look behind the things that line buildings. Look on the ground. There are plenty of poster birds.